You've just gotten home after a brutal day at work. The headache from your busy schedule would love nothing more than to be relieved by a warm welcome from your family. As soon as you open the door you hear the high-pitched voice of your wife as she is scolding your ten-year-old son, while his little sister is sobbing because he broke one of her new dolls. So who is the loving one that meets you at the door? “Sammy” does, your three-year-old mongrel dog. He's wagging and wiggling from his head to the tip of his tail. He dances and jumps into your waiting arms, and, if you allow him, he licks you on the face. He's glad to see you. Your dog has expressed himself in the language that he knows you understand. 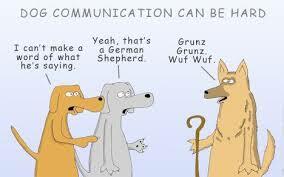 Your dog, like pet dogs all over the world, use body language and a variety of vocal sounds to communicate with his owner. The dog possesses an incredible ability to communicate with his owner: a universal language, telling man of danger, desire, loyalty and love. Your dog talks to tell you how sad he is when he's scolded. He shouts loud and clear his distress when a stranger or something unusual approaches, and he talks to you about how happy he is to be near you and share your companionship. 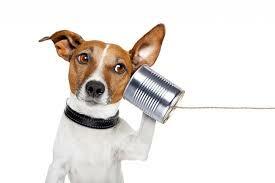 Your dog talks best with his tail. When you accidentally step on your pet or upbraid him, he will tuck his tail between his legs and cower down, showing his submission. By tucking the tail, the dog is hiding his scent and thus hiding himself. This language seems to go back to the ancient wild dog when submissiveness and dominance existed in the pack. He yanked a brocade pillow from a neighbor's clothesline and brought it home. After placing the pillow at Angelica's feet, he wagged his tail in sheer joy that he was pleasing his owner and sharing her prenuptial pleasures. As you can see from this wonderfully heartwarming example of this Collie's desire to communicate pleasure, dogs are also much more intelligent than we give them credit for, especially in the communication department.